a Class*y Collaboration: A Class*y Cruise...Around the Classroom Linky!! 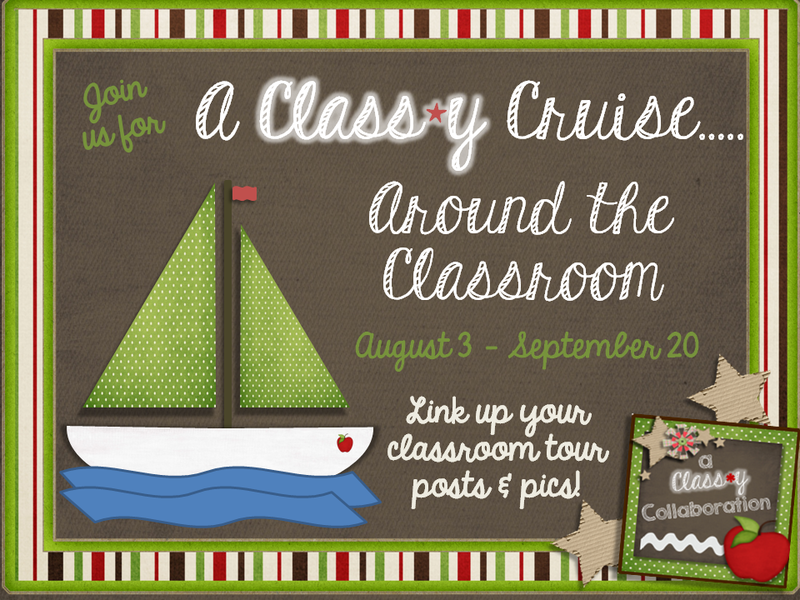 A Class*y Cruise...Around the Classroom Linky!! This is going to be Legend.Ary! Link up your classroom tour posts and pics, ladies & gents! Since everyone goes back to school at different times, we're going to keep this linky open until September 20th. Link up! You can link up a tour of your whole classroom....or come back every so often with features of your room! We'd love to see your desk area, small group meeting area, library....you name it! Can't wait to tour YOUR classroom! I'm glad you're keeping this open for a while because my room is NOWHERE NEAR READY!! I'm kinda freakin' out about how much I have left to do! I know EXACTLY how you feel, Jenny! I was really stressing it there for awhile!! Can't wait to see your classroom when you're ready! LOVE looking at other classrooms! I'm glad you're keeping this open so long, I don't even see my classroom for another few weeks. I agree. We don't start school here until Sept 3rd. I haven't even thought about decorating my room! I love this idea. I LOVE looking at everyone's pictures. Great idea! I love to see how others do their room! I'll be linking up! I love seeing all these classrooms! I'm heading over to check out your blog now. You ladies are so sweet! Glad I found this linky - I've linked up, then pinned it and posted to FB and G+, so hopefully we'll have even more classrooms to peek into soon! It's so inspiring. I found your blog through this linky so I am glad we did it too. Thanks so much for linking up and I'll be by soon to grab some of that great clip art you've got! I am so excited!! I just joined my first Linky Party!!! I hope this gets some more people to check out my new blog! Thank you! Yay! I'm excited for you, Aimee! I'm heading over to check out your room! Great!! So glad you linked up, Alexis! Need Some Class*y Additions for Your Classroom? Pronouns, Paragraphs, and Photographs - Oh My! What are you carrying back to school?